NetherlandsNavy.nl. Fair use may apply. Doorman one of the pioneering naval aviators of the Dutch navy, surviving 33 emergency landings before attended the Naval Staff College in 1921. 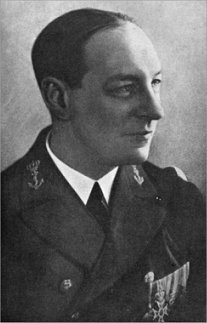 He served with the naval department at Batavia and commanded destroyers and cruisers prior to taking command of the Royal Netherlands Naval Air Service in the Netherlands East Indies in 1938. By 1941 Doorman was a rear admiral in command of all Dutch naval forces in the Netherlands East Indies. For political reasons, Doorman was placed in command of the combined ABDA naval squadron defending the islands. This was a nearly hopeless task, as the ships had had no experience working together, used different equipment, and had different communications protocols. As a result, the Allied squadron was soundly defeated in the Battle of the Java Sea, and Doorman chose to go down with his flagship. The famous American historian Samuel Eliot Morison obliquely criticized Doorman in his monumental history of the naval war, charging that he was inexperienced and not sufficiently aggressive. This assessment does not stand up well. Doorman had been a naval officer for 32 years and had been one of the first flying instructors in the Dutch Navy. If anything, his conduct as a commander reflects an element of recklessness, perhaps reflecting the desperation of the Dutch to defend Java. Given the disadvantages under which he operated, it would have been remarkable if Doorman had achieved much more than he did. Karel (1999) describes him as "a very special and very difficult man" in poor health from tropical dysentery, but praises him for his airmindedness.